In keeping with our mission of providing compassionate and comprehensive care for our patients, we welcome Dr. Kendra Nicholas as our newest the Cuyahoga Falls Veterinary Clinic team! Dr. Kendra grew up in the suburbs of Pittsburgh, PA. She received her B.S. in Animal Bioscience with a minor in Equine Science from The Pennsylvania State University in 2009, and her DVM from Mississippi State University College of Veterinary Medicine in 2014. 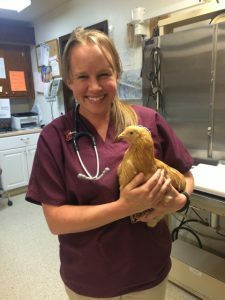 Most recently she’s spent 2 years at a mixed animal practice in central Ohio, and is now joining us as an associate veterinarian. Her professional interests include preventative medicine, theriogenology, and internal medicine. Outside the Clinic, Dr. Kendra enjoys fishing, weightlifting, Crossfit, teaching Zumba, hiking and running with her dogs, and spending time with her husband and family. Dr. Kendra and Matt were married in October, 2015. She’ll begin seeing appointments on Monday, August 29. When you come for your visit to CFVC, make sure to say, “Hi!” to Dr. Kendra! Comment on "CFVC Welcomes Dr. Kendra Nicholas!" Dr. Nicholas is my cat Gizmo’s dr. I really like her. She is very kind, considerate, and really cares about our pets. I hope she stays there.